We arrived to the event shortly before sunrise. It was chilly outside, and I could not move around enough to stay warm. I was anxious and could not handle waiting around for others to show up in the parking area. I was so focused on the run that I could not think of anything else. No distractions. I was on a mission. I had to get to the runner’s area to scope things out. 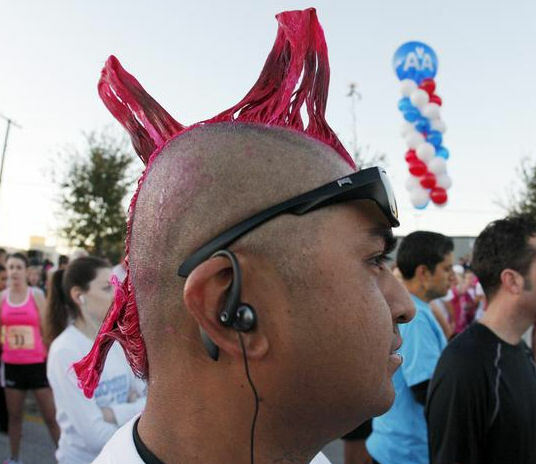 I hi-tailed it over to Northpark Mall, and saw the ocean of people who were arriving all wearing the color pink in some fashion; pink wigs, pink shoes, pink socks, pink shirts, pink sprayed-up mohawks, pink boas – pink everywhere!! I found the starting line for the runners. You could tell it was serious business for some folks, because they were the ones focusing on stretching, hi-stepping, and running short sprints back and forth. It made me look around and think, “Am I supposed to be here?” Of course I was! This was one of my goals! I chit-chatted with a few folks that were standing around with me, and there was much talk about running events. This being my first one, I mostly listened. A girl next to me was as nervous as I was, but she had much more experience than I did. I would have thought that like me, this was her first go at a running event. She spoke of getting head-spun when people start to run past her. I assured her that this was for fun, and not to worry. Besides I told her, I was probably going to get passed by her! As we talked I learned that she had already run a half marathon! Excuse me what? She was nervous about 3.1 miles, after having experienced running 13.1 miles? Wow! I took some comfort in this, because it made me realize that event anxiety hits people with all levels of experience; not just rookies like me. As it got closer to start time, the runners group filled in. We moved closer to the front line, right behind the elite runners group. The body heat from the shoulder-to-shoulder crowd started to crack through the morning chill. I wore a long sleeved running shirt over my running tank, but no longer felt the need to wear it. At 60 seconds before go-time I was quickly removing it, and tying it to my waist. I had my iPhone music cued up, and was in the zone. The countdown began. 45 seconds. 30 seconds. Getting antsy as hell. 15 seconds! 10 seconds!! Oh hell here we go! 3…2….1!!! I started running and hit the button on my headset cord to fire up my paused music. No-go. What the? As I ran I was fumbling to put my iPhone out of my running pouch. I quickly glanced at it and fired back up the iPod app. Music is on! It’s go time! I ran at a pretty comfortable pace. I just kept telling myself to run my own race, and as each person passed by I reminded myself to chill out and enjoy the moment. The gal who was next to me at the start, who was anxious about the passers-by, was now behind me. I started to run next to her and give her some encouragement, but she was in her own world. I became one of those people who pass her. I didn’t glorify it, because I just figured that as soon as she got into her rhythm, that she would pass me up eventually. The route was full of rolling hills, that I tried my best to ignore. I just kept my sight low, and focused on running. At one point I felt a tap-tap on my shoulder, and looked up to see a couple of my friends run by me. We yelled out to one another, and they ran on. They had a good pace going, and I was tempted to step it up to try to keep up, but pulled back so I could actually finish this without being hurt or burning my legs out. At the 2 mile mark, there was a digital clock that showed the current race time. Since I was towards the front of the crowd at the start, I knew this was pretty indicative of my own pace. It showed 19 minutes. Holy crap! 19?? I was going faster than I thought! In the group I spotted a little girl who looked to be about eight or nine years old. She was running her little heart out, and was running fast! She would slow it down for a moment, and then off she would go. I could never catch up to her! Hats off to that kid’ she was a runner at heart! As the finish area came into view, I tried to remain composed and not kick up my speed too soon. My legs felt a little more tired than in my usual training runs. I didn’t want to fizzle. Run. Run. Run. I saw the finish line and tried to pick up speed. It didn’t feel like it was happening for me, so I just dug in and crossed the finish line. Are you kidding me??? All my training runs average out to be about 37:00! I felt on top of the world! No I’m not super-duper fast, but that was a huge for me. Christie also did well on the 5K. She started out walking with her co-workers, but at the half-way point she ran the rest. So proud of her! 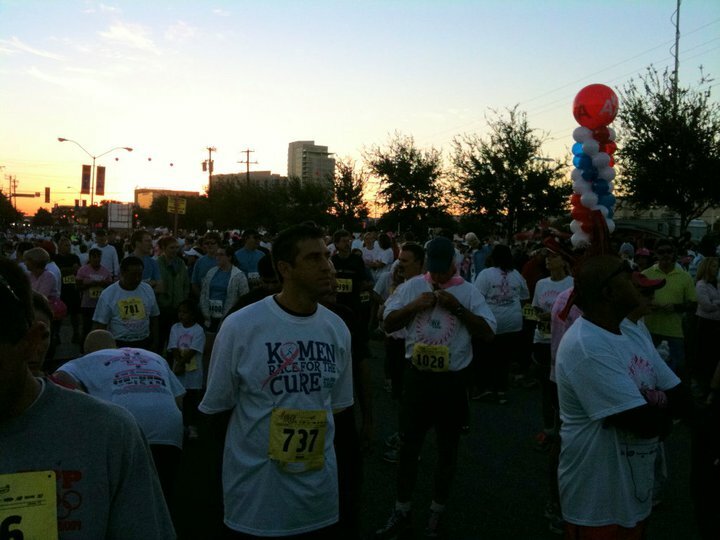 So there you go – I finally did it; I ran the Komen Race for the Cure 5K! 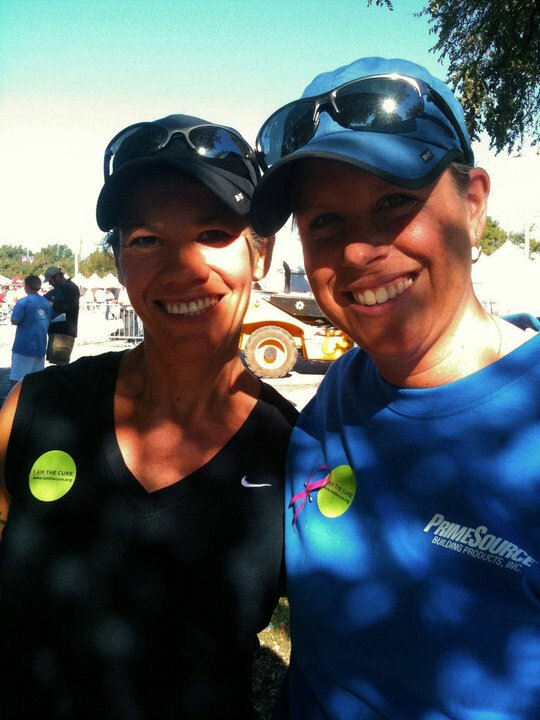 I’m so ready for my next running event – Turkey Trot 8-miler on Thanksgiving here I come! This entry was posted in 5K, Accountability, Run for Fun, running events and tagged 5K, dallas, fitness, marathon training, running by Raven. Bookmark the permalink.